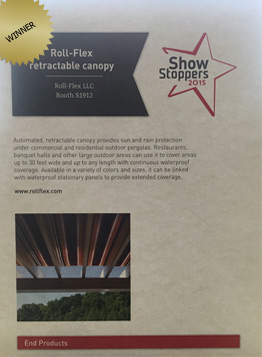 roll-flex.com — Roll-Flex Motorized Retractable Canopies. Perfect to enhance outdoor space. Roll-Flex is the invention of Sam Mazzarelli, owner of Commercial Sewing Inc, who brings 50 years of commercial manufacturing and engineering expertise to this unique product. Sam wanted to spend time outdoors with his family and not worry if it was too sunny or if there was a chance of rain. He wanted to find an attractive way to provide sun and rain protection when desired. He realized, after searching long and hard, that such a product did not exist. There were pleated, under-mount products that covered the bottom of the rafters with a lot of fabric and prevented him from hanging plants. There were top mounted shades that would not keep him dry because the fabric was suspended above the pergola rafters and could fill with water. They could not be extended when it was windy. Being an innovator, he set out to design and build the Roll-Flex Motorized Retractable Pergola Canopy. His patented dual motor, multi track design is easy to install and can be made to fit any size pergola. The Roll-Flex canopy is durable, functional, and looks great. Problem solved. ROLL-FLEX® RETRACTABLE CANOPIES Transform any pergola or shade STRUCTURE into functional outdoor space. Just think, a retractable roof for your outdoor kitchen. Sun and rain protection when you need it. No need to build big, expensive, fixed roof structures that block the sunlight ALL the time. Sun or shade at the push of a button. If it starts to rain, push the button and keep your cushions and furniture dry. Whether it's in your backyard, on your deck, or at your favorite outdoor restaurant, Roll-Flex Retractable Canopies are the perfect way to enhance an outdoor space. Each retractable canopy operates independently. This is ideal for large outdoor dining spaces where some customers enjoy sun and others want shade. Individual Roll-Flex® retractable canopies are up to 16 feet wide and can extend up to 28 feet long. All Roll-Flex® products are warrantied for five years. Warranties inquires / issues may be addressed by calling our warranty dept at (860-806-9390) or by emailing us. Our fabrics have outstanding water repellency and breathabilty but are not waterproof. Some misting may occur during heavy rains. Canopies should be retracted when not in use for sun protection.